The Cabinets can be stacked on one another or mounted on a wall to free up workspace. For sewing, these drawers are great for organizing beads, buttons, trims, and thread. Wall mountable for space saving organization. | eBay! 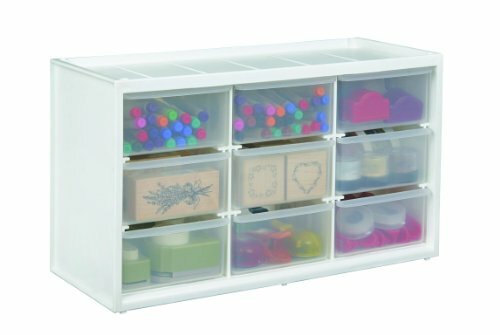 The Store-In-Drawer Cabinet conveniently stores a variety of art and craft supplies. The Cabinets can be stacked on one another or mounted on a wall to free up workspace. The drawers can be divided for added storage (dividers (6805PC) sold seperately). Sturdy white plastic storage unit includes 9 transparent drawers (approximately 2-1/2 by 4-3/4 by 5-1/2-inch). For sewing, these drawers are great for organizing beads, buttons, trims, and thread. For scrapbooking and papercrafting, organize your punches, stamps, glitter, embelishments and gel pens. In the art studio store your watercolors and drawing supplies. They also store jewelry and cosmetics beautifully.